With great power—comes great responsibility. In 1963, these prophetic words launched one of the most successful and recognizable characters of the 20th century… Spider-Man! The powers granted bookish Peter Parker by a radioactive spider have fueled the imagination of fans worldwide for nearly 40 years. With the dawning of a new age, however, come a hero for the new millennium... 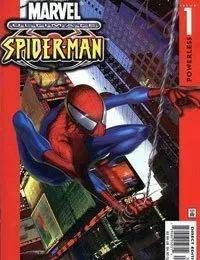 Ultimate Spider-Man! Updating Spider-Man for the 21st Century was no easy task, and it took the brilliant mind of Brian Michael Bendis to do just that. With the artistic talents of Mark Bagley and Art Thibert breathing new life into this legendary mythos, Spider-Man has reasserted himself as one of the most popular characters in the world!